"I’ll tell you something that’s really weird [after I finish these interviews] I’m jumping in my car, and I’m driving to the studio to do another three hour session for Destiny and put on my Shaxx bellow," James said. "And before I started my interviews today I was looking through his lines, and in the new incarnation he quotes Shakespeare, and it’s really... it’s quite a lovely line". "I think he quotes a bit of Hamlet - I can’t remember what it is and it’s now completely gone out of my mind - but he quotes a bit of Hamlet and then comes out of the end of it going something about the Guardians and 'You are not a Prince, you are a Guardian!' - and the line has really stuck for me because it’s just put together so cleverly, so... I don’t remember many of the lines because the sessions are just so full on, but I’m looking forward to saying that particular line!" And James referenced a similar - but definitely different - Shaxx line when GameSpot asked him for a favorite. He said he recorded this one for "another add-on that they're bringing out for Destiny 2 in the next few months," which sounds a lot like Curse of Osiris. "There is one where he kind of quotes Shakespeare," James said. "'But soft! What light through yonder window breaks? It is the East, and I - I am the Crucible.' That was quite good fun. 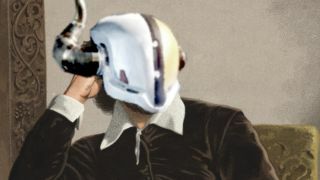 [Shaxx] has become a little bit full of himself!" That one's a nod to Romeo and Juliet's iconic balcony scene, and also to Shaxx occasionally muttering "I am the Crucible" in the first game. Granted, you never know how things will shake out with game development: neither of those lines might actually make it into the final version of Curse of Osiris. But given the fact that at least two different Shakespeare quotes are being considered for our beloved battle pal, maybe we should start calling him Shaxxspeare.